Dr. B.S. Bhooshan B. Arch (Kerala) M.TP (Madras) Ph. D (Mysore) brings a variety of experiences to the firm with three decades in teaching, research, consultancy and practice. Been a consultant to United Nations and a Visiting Professor. Ar. 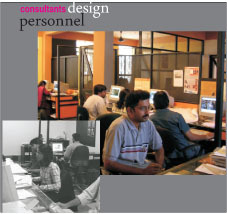 Sunil Nayak B. Arch ( MIT, Manipal). Has Experience in different work environments over seven years. Been with the firm for last six years. Adept in handling detailing and coordination. Ar. Sudheendra B.Arch (Mysore) with over three years experience with us. Ar. M. Muthukumar B.Arch (Bangalore) with previous experience in other architectural offices is looking after the Bangalore studios. Ar. Vishu Bhooshan B.Arch (Pune) M.Arch (AA, London) worked with us for more than 2 years. Right now in London and associates with us on line. 1. Prof. C.N. Yadunandan ME, Former Assistant Professor, SJ College of Engg, Mysore specialising in prestressed concrete, Yadu has over 25 years experience in structural design and cost effective construction and design. Mr. M.S. Vijayakumar B.E, Mysore has design and field experience of over 25 years in large and medium projects of various kinds. Mr. Aravind Bandiwad, B.E Has over 25 years of field experience in a variety of circumstances.